Around 30,000 people took part in the protests on February 5. French trade unions organized a general strike, and massive mobilizations on Tuesday, seeking an increase in wages and pensions,. The demands include a minimum wage for interprofessional growth (Smic), social and fiscal justice, and the development of public services. The call was given by the General Confederation of Labour (CGT), Solidaire and Unitary Trade Union Federation (FSU). According to reports, around 30,000 people marched in Paris alone and nearly 300,000 participated in various marches that took place in 200 cities across the country, including Saint-Etienne, Angers, Poitiers, Montpellier, Bordeaux, Grenoble, Saint Avold, Rouen, Valencia, Nancy, Nantes, Bourg-En-Bresse, Marseille, Orléans, Perpignan, Troyes, Roussillon, Tours, Rungis, Lille, etc. There was also a massive participation of the Yellow Vests in Tuesday’s mobilizations. Many progressive sectors in French society, including the left, appreciated the cooperation of Yellow Vests and trade unions in the struggle for social justice. 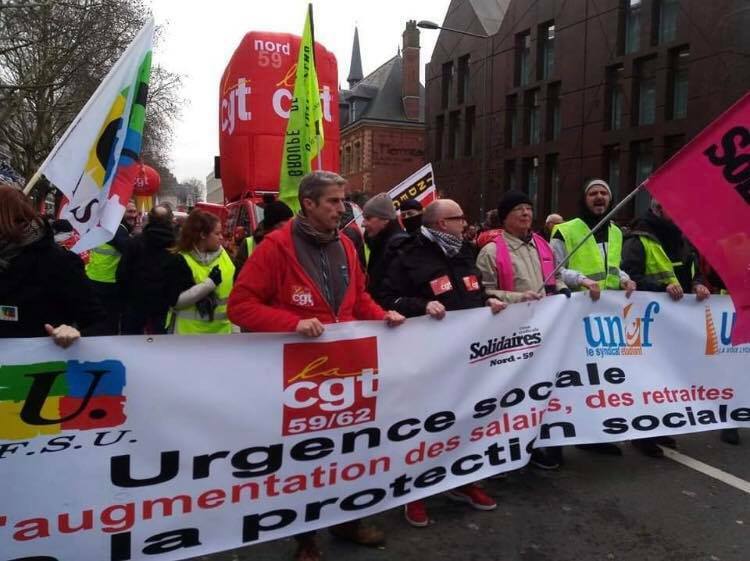 In a statement, the CGT applauded the participation of the Yellow Vests protesters in the strike of the organized sector. “The 57 billion euros (USD 67.17 billion), paid to shareholders of large companies in France recently, demonstrates the magnitude of wealth created by workers. Beyond the mobilizations of citizens for many weeks, it is essential to build a balance of power, including the strike, to impose redistribution of wealth on employers,” they added. Various youth organizations, including the Mouvement Jeunes Communistes de France (MJCF), expressed solidarity with the strike and actively participated in the mobilizations in Paris, Lille, Montpellier, Orléans, etc. Meanwhile, on Tuesday, the French Parliament passed an “anti-casseurs” (anti-hooligan) law to curb violent protests in the country. The law bans protesters from hiding their faces, gives police greater power to take care of the alleged trouble-makers in demonstrations and grants local authorities the right to ban individual protesters. The law was passed in the parliament with the support of 387 votes, while 92 MPs opposed it. About 50 MPs, from the French president Emmanuel Macron’s Republic on the Move (LREM) Party abstained from voting. France 24 reported that the new law called for a six-month prison sentence and a €7,500 (USD 8,500) fine for violators. The legislation, if passed by the upper house and approved by the constitutional council, would also allow fines of €15,000 (USD 17,000) and a one-year prison term for demonstrators covering or masking their faces to escape identification. Many sectors within the opposition and civil society raised concerns regarding the legislation, which they believe can be misused to curb the freedom to protest. In February, the progressive French newspaper, L’Humanite, noted that even after 7,000 arrests, 1,900 injuries and 1,000 convictions in two months, the French police, as well as the repressive judicial order, had not done enough to defend the established order. Those in power now want to attack the freedom to demonstrate. On February 2, the Yellow Vests protesters hit the streets for the 12th consecutive week since November 2018. Several protesters were severely injured after the riot police repressed the marches with grenades, tear gas and batons. Many protesters were reportedly arrested in various places. The Yellow Vests movement began on November 17 after the Macron-led government announced a hike in fuel taxes, purportedly to combat climate change. This decision was the last straw for the French people who were furious at all the anti-poor reforms that Macron has passed since taking office. In the face of huge mobilizations, the government was forced to roll back the tax hike. In addition, Macron also announced tax cuts for pensioners and asked bosses to give bonuses to their workers. But these small overtures have failed to placate angry working classes and lower middle classes of France. Hey Buddy!, I found this information for you: "French unions, Yellow Vests join hands, seeking higher wages, social justice". Here is the website link: https://peoplesdispatch.org/2019/02/07/french-unions-yellow-vests-join-hands-seeking-higher-wages-social-justice/. Thank you.